LS-F36234 is a 96-well enzyme-linked immunosorbent assay (ELISA) for the Quantitative detection of Human CD40L in samples of Plasma, Serum and Tissue Homogenates. It is based upon a Sandwich assay principle and can be used to detect levels of CD40L as low as 37.5 picograms per milliliter. 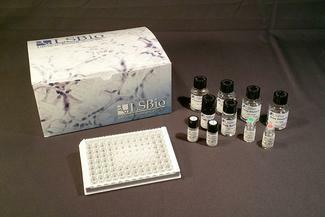 This kit was based on sandwich enzyme-linked immune-sorbent assay technology. Anti- CD40Lantibody was pre-coated onto 96-well plates. And the biotin conjugated anti- CD40L antibody was used as detection antibodies. The standards, test samples and biotin conjugated detection antibody were added to the wells subsequently, and wash with wash buffer. HRP- Streptavidin was added and unbound conjugates were washed away with wash buffer. TMB substrates were used to visualize HRP enzymatic reaction. TMB was catalyzed by HRP to produce a blue color product that changed into yellow after adding acidic stop solution. The density of yellow is proportional to the CD40L amount of sample captured in plate. Read the O.D. absorbance at 450nm in a microplate reader, and then the concentration of CD40L can be calculated.